St Mary's church in Old Welwyn was the venue for our spring concert in March, and we could not have asked for a better start to the year: splendid facilities, a warm welcome and definitely one of our biggest audiences - we ran out of programmes, which is always a great sign! Three items on the programme were by Gabriel Fauré - his beautiful Requiem (featuring solos by Judy King, Chris Blackman and Phil Rowe), the Cantique de Jean Racine, and Après un Rêve, which was performed by the sopranos and altos. The men got their chance to shine in a traditional Irish blessing, and the choir contributions were completed by Franck's Panis Angelicus and four folk songs arranged by Martin Leadbetter. The madrigal group - Lydia Hardman, Joy Seymour, Angie Caldwell, Pat Holmes and Phil Rowe - presented two pieces, and after his solo performance of a Bach prelude on the organ Clifton Hughes joined Angie Caldwell in Saint-Saens' duet Mon cœur s'ouvre à ta voix from Samson and Delilah. On the opening weekend of the Hitchin Festival in June we joined forces once again with the Stevenage Symphony Orchestra, under the direction of Phillip Brunton, to present Handel's Coronation Anthem The King Shall Rejoice, and Dvorak's Te Deum with soloists Susanna MacRae and Jolyon Loy. On a warm summer evening at St Mary's in Hitchin, our audience members were glad to take their refreshments outside! Our contribution to the Armistice commemorations in November took place at St Nicholas' church in Stevenage, where we performed Herbert Howells' moving Requiem and other music marking both the end of the First World War one hundred years ago, and also the centenary of the RAF. Solo roles in the Requiem were sung by Julie Hartley, Grace Gillions, Joy Seymour, Angie Caldwell, Bryn Waterhouse, Ken Bradbury, Clifton Hughes and Peter Mackenzie; our guest bugler Dan Taylor opened the concert with a beautiful Last Post and the musical items were interspersed with poetry readings. ​In December we were invited to join in the patronal festival celebrations at the church of Our Lady Immaculate in Hitchin. In the absence of Anne-Marie Hetherington, due to illness, our indefatigable accompanist Clifton Hughes stepped in to conduct the programme of seasonal music, including solos from Julie Hartley, Bryn Waterhouse, Helen Martin and Louise Newton; other individual contributions came from Jenny Smith, Joy Seymour, Phil Rowe, Ken Bradbury and Chris Blackman - who also took the conductor's 'baton' at one point while Clifton was otherwise engaged at the organ. A large audience ensured that the church made an unexpected profit! An evening of JS Bach at St Mary's, Baldock, in March opened our 2017 season. The first half of the concert was Cantata No. 80 Ein feste Burg ist unser Gott, featuring solo contributions from Phil Rowe, Maggie Griffith, Julie Hartley, Ken Bradbury and Angie Caldwell. Organist Clifton Hughes opened the second half with the Toccata and Fugue in D minor, then Chris Blackman played the organ prelude to our second cantata, No. 227 Jesu, meine Freude. The two trios were performed by Sandra Eagle, Maggie Griffith, Joy Seymour, Grace Gillions, Robert Girvan and Peter Hewitt. Appropriately for our concert in June, at St Michael's church in Letchworth, the programme featured summery music - the choir entered to the traditional round Sumer is Icumen In, and the female voices sang an arrangement of Thomas Hardy's poem Summer Scheme arranged by Sally Gray. The audience also enjoyed Martin Leadbetter's arrangement of four folk songs, Benjamin Britten's The Ballad of Little Musgrave sung by the male voices, Elgar's From the Bavarian Highlands, and a medley of favourites from West Side Story, with contributions from George Lazlett and Rosemary Read playing Mozart's Rondo from Duo K423, and Clifton Hughes performing a 'theatre organ' selection from Fiddler on the Roof - to remind everyone that we were raising money for the church's roof rebuilding fund! Finally on a freezing evening in December we were warmly welcomed by the congregation of St Denys in Colmworth where our programme included motets by Poulenc, Monteverdi's Beatus Vir and a mixed bag of other Christmas music featuring Lydia Hardman, Judy King, Ken Bradbury, Chris Blackman and other choir members in solo roles. Perhaps we took a bit of a risk singing Clifton Hughes's arrangement of White Christmas - it snowed the next day! After the postponement from October 2015, because of vital restoration work to the church organ, we were at last able to fulfil our promise to perform at St Katharine's in Ickleford in March with a programme designed to show off the instrument. Although we began with the unaccompanied Missa Papae Marcelli by Palestrina, the shiny new pipes were allowed to let rip in the second half with Vivaldi's Magnificat, featuring solos by Sandra Eagle, Gill Bland and Ann Hartley and a duet by Julie Hartley and Maggie Griffith; Clifton Hughes played John Stanley's Voluntary VIII and Bach's Toccata and Fugue in D minor, and St Katharine's own organist, Clifford Rowe, got his turn at the keyboard accompanying an arrangement of Sir Arthur Sullivan's The Lost Chord. Our regular Hitchin Festival concert in July found us at Holy Saviour church in Hitchin singing items themed around Night and Day. As well as the Cole Porter classic of the same name, the music included extracts from Rachmaninoff's stunning Vespers with the alto solo sung by Angie Caldwell, Delius's 'song without words' Summer Night on the Water, and Sir Arthur Sullivan's setting of The Long Day Closes. We also introduced our new madrigal group, comprising Judy King, Joy Seymour, Angie Caldwell, Ken Hollow and Phil Rowe, who performed two pieces by Thomas Tomkins. We rounded off the year with a well-attended concert in December at St Mary's, Hitchin, where we were delighted to welcome back the Buccinate Brass ensemble for a performance of John Rutter's Gloria. Eleven members of the choir sang individual roles in a programme which included three of the Chester motets, Britten's A hymn to the Virgin, five lesser-known Christmas carols and a new setting of the Coventry Carol by choir bass Martin Leadbetter, while the brass players added their own touch of seasonal flavour with arrangements of Jingle Bells, Deck the Halls and We wish you a Merry Christmas. In March we were invited to perform at the church of St Edmund and St James in Blunham. It was definitely a concert of two halves - contrasting Byrd's Four Part Mass with well-loved standards and a comic song from Flanders and Swann! For our contribution to the Hitchin Festival in June we performed with our friends from Buccinate Brass at St Mary's in Hitchin. The programme included Purcell's Funeral Sentences, extracts from the Monteverdi Vespers with solos from Maggie Griffith and Angie Caldwell, and Heinrich Schutz's setting of Psalm 150 Alleluja! Lobet den Herren in Steinem Heiligtum, featuring several other members in solo roles. Julie Hartley and Sandra Eagle gave a beautiful rendition of Pur ti miro from Monteverdi's The Coronation of Poppea and, to commemorate the 600th anniversary of the battle of Agincourt, the evening closed with a stirring version of Non Nobis Domine, the battle hymn from Kenneth Branagh's Henry V, and The Song of Agincourt arranged by choir member Martin Leadbetter. Finally we wrapped up the year with a Christmas concert at All Saints', Clifton in December, starting with a selection of movements from Handel's Messiah featuring solos from Angie Caldwell, Phil Rowe and Grace Gillions. The second half included two of the Chester Motets and a variety of carols, paying special tribute to the late Sir David Willcocks. For our Lenten concert in March we performed our programme twice: on March 15th we were in Tilehouse Street Baptist Church, Hitchin and the following Saturday we travelled to St Mary's Church, Pirton. The first part of the programme was Byrd's Four Part Mass, then after the interval we sang Hear My Prayer by Purcell , Lotti's Crucifixus, a duet from Pergolesi's Stabat Mater, Ian Harrold's Ave Maria, O Magnum Mysterium by Morten Lauridsen followed by two short organ solos. We finished with Rachmaninov's Ave Maria (Bogoroditsye Dyevo) and Fauré's Cantique de Jean Racine. We felt most warmly welcomed at both venues and thoroughly enjoyed our visits. We were proud to open the 2014 Hitchin Festival with our concert at St Mary's Church, Hitchin in June when we teamed up with Stevenage Symphony Orchestra to perform Mozart's C-minor Mass, with soloists Alison Rose, Kate Howden, Nicholas Scott and Richard Walshe. In the first half of the concert the orchestra, under their own director Phillip Brunton, performed Brahms' Academic Festival Overture and Elgar's Enigma Variations. Our contribution to the First World War centenary commemorations took place at St Mary's Church, Baldock, in November when the programme included Fauré's Requiem, with solos from Judy King, Phil Rowe and Chris Blackman, and a setting by Martin Leadbetter of the poem In Flanders Fields. Audience members were persuaded to join in a rousing rendition of Pack Up Your Troubles/It's a Long Way to Tipperary, and on this special occasion it was moving to see so many people standing to sing Jerusalem. The welcome we receive at Great Wymondley is always so warm, we love performing there; and our Christmas concert in December was another happy occasion. 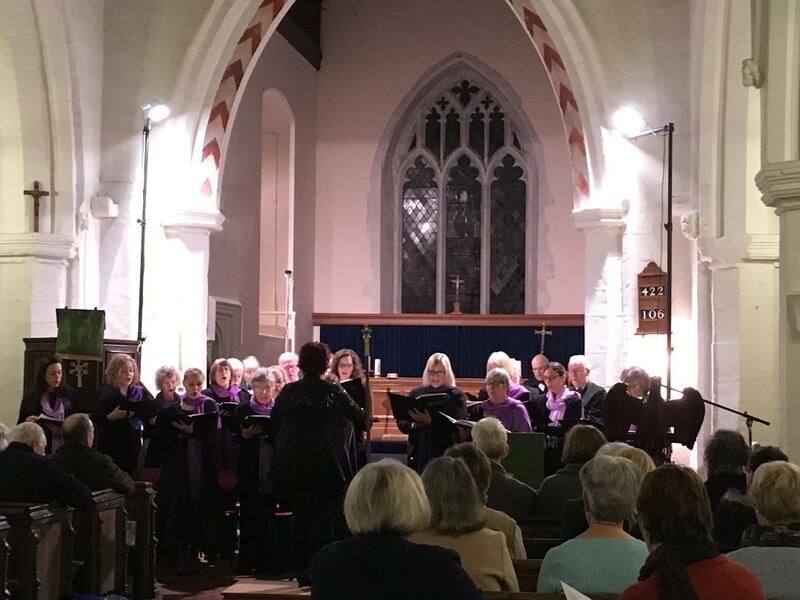 The programme included extracts from Handel's Messiah, with solos by Ellie Scott, Angie Caldwell, Beth Hutton and Judy King, and each half of the concert began with 'trademark' Orpheus a cappella items. In March we had the great pleasure of singing Bach's St Matthew Passion at the Coptic Church Centre in Stevenage alongside our friends in the North Herts Guild of Singers, with four of our members taking small solo roles. Our Hitchin Festival programme in June at St Mary's Church, Hitchin, accompanied by the Buccinate Brass Ensemble, was called The Glory of Venice and featured the Vivaldi Gloria, In Ecclesiis and Jubilate Deo by Gabrieli, and two works by Monteverdi. ["Your best concert yet"~ audience member]; and in December we visited St Ippolyts Church, whose vicar was one of our members at the time, to perform Poulenc's Christmas motets (Quatre motets pour le temps de Noel), Stravinsky's Ave Maria, three works composed by choir members and a light-hearted take on the Twelve Days of Christmas. In 2012 our Lenten concert in March took place at St Denys, Colmworth and featured Haydn's famous chorus The Heavens are Telling from The Creation. For our Hitchin Festival concert in June we joined forces with Stevenage Symphony Orchestra to present Mozart's Requiem at St Mary's, Hitchin. Finally our Christmas concert, which included music by choir members Clifton Hughes and Martin Leadbetter alongside works by Britten and Tavener, was presented twice - at All Saints Church, Clifton on November 24 and again on December 8 at St Lawrence Church, Willington. The Hitchin Festival of 2011 saw us at St Mary's, Hitchin singing Mozart's Ave Verum Corpus, Bruckner's Locus Iste and Frank Martin's eight-part Mass, as well as lighter items from our repertoire of folk music and spirituals; and for Christmas we were at St Ippolyts Church singing Bach's Christmas Oratorio and O Nata Lux by Thomas Tallis. In previous years we have celebrated Independence Day with American music and a cream tea (2008); marked our 40th anniversary with a burst of Handel's Dixit Dominus and performed Rheinberger's Mass in E-flat at St Katharine's, Ickleford, in aid of the church building fund (2009) ; visited St Mary's in Little Wymondley for a Lenten concert, paid tribute to our founder by performing his arrangements of folk songs at St Paul's, Letchworth, sung to the Virgin Mary at St Mary's, Hitchin and chirped about birds in St Martin's, Preston (2010).